Our lives on this planet are changing. We are at a point in time where we all have to do more to help our world survive, fast. We have just 11 years left to totally change the world. Many of us are on-board with this and the army of eco-conscious citizens swells daily, but what about those of us who travel? 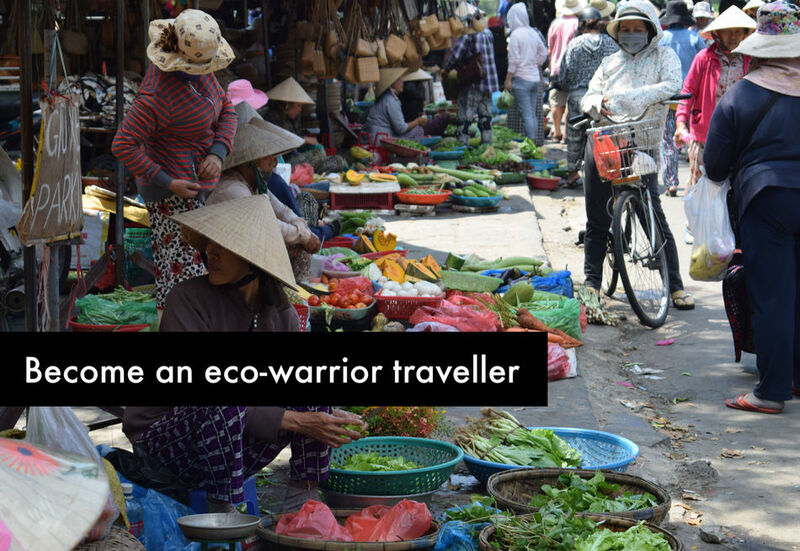 Is there such a thing as an eco friendly traveller ? I’m not going to stop travelling through choice and I don’t suppose you are either so we’re in a difficult situation. Yes we should cut the planes, but can we? Tourism makes up 8% of global greenhouse gas emissions, there are far bigger offenders, but every one of us can do something, a little or the most we possibly can, to cut that back. Travel is something that runs through the veins of wanderlusters but people keep telling us not to fly. They have a good point. Flying has a big-old carbon footprint that we can’t ignore so indulgently zipping around the world just for the hell of it – let’s call time on that. Maybe a day will come when we have to stop flying completely as well as totally changing our at-home behaviours. Maybe that day has already come and we just don’t realise it. For now, let’s just see what we can do to lessen our carbon footprint and be more eco-aware. Stopping our flying is only a part of the picture, the way we live, our consumption and our homes, the balance of what we consume and what we create all has to change. I fully believe that our last 6 years have had a way lower impact on the global environment that we would have had if we’d stayed home, why I believe that comes in the final paragraph. Walk or cycle to the market, buy local, eat street food, all are easy for travellers to achieve and most do this without even trying. Long Term Travel is Better For the Planet Than Staying Home- Or Is It ? Make your home and garden so perfectly eco-awesome that you can start to offset the carbon debt you create by flying. Plant trees, grow food, get rid of your lawn, ditch the car, lose the aircon, do not under any circumstances use electric driers, stop consuming. Hard,I know. We have a pool and pool pump. That’s a hard one to get rid of. But tumble driers are easy to ditch. When you’re travelling take the room that’s non A/C, fan only. You’ll save yourself cash and carbon. Fans are hundreds of times more energy efficient that airconditioners and central air conditioning is by far the worst. Girl v Globe has explained it well in her post. Vote out the cash driven idiots at the helm who prefer money to a habitable planet. Use your vote to bring change. Complain, loudly, if you see a company screwing up the environment. If your voice is small bring it to me and I’ll use my social media presence if I can. Spread the world and let people know what has to be done and what has to stop. It has to be done, we all need to fly less. I’d rather take a bus or train anyway and most of our travel around Asia or Europe is by land. In Asia overland travel is normally cheaper and a wonderful way to explore. You see and experience far more on the ground than in the air. Staycations are the way forward for many. Unfortunately, we’re based in Australia right now so we’re pretty stuck. Buses and trains cost more than flights and there’s really no other way out. Wouldn’t it be great if we could easily and eco- consciously travel by boat from Australia to Asia? Some dude crossed to Papua New Guinea on a jet ski recently, so there must be a way. A return to sail, wouldn’t that be amazing! Travel is my business as well as my passion, it’s how I provide for my family, so living in a place where flying isn’t required is something we’re considering for the future. Pick up a phone, Skype, use e-mail. 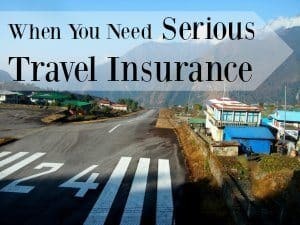 People travel for many and varied reasons, but some flights can easily be avoided. Don’t send a letter or card, we don’t need to print in the electronic age. Big hotels guzzle water to keep golf courses green and pools topped up. They run air-con in open spaces. They produce mountains of food that goes to waste. They bleach, boil, launder and press daily. It is so unnecessary. This has to stop, this isn’t travel, it’s self indulgence. Some big hotels and resorts are working towards decreasing their footprint. Pick those, not the ones with the disposable plastic bottles for every guest. In my town the big hotels are exempt from annual summer water restrictions. They can top up their pools and water golf courses while I can’t water my fruit trees. How does that make sense? Cruise ships are massive environmental criminals. Again, this is not travel. Share buses, share trains, share that big pot of mi quang at the street stall, share rides, share gear, share resources. Buy second hand, pass your trekking gear on to the person you meet who’s heading to Nepal, pass it on, share the love, decrease manufacturing need. This goes without saying, buses and trains are so much better than private cars. If you have to use a car, fill it with people. A return to safe hitch hiking would be wonderful. We’d always pick up hitch hikers in Romania, it’s normal there and people trust. A vegetarian has half the carbon footprint of a meat eater’s. A vegan’s is lower again. Beef is a big culprit, so if you can only switch out the beef for chicken, you’re doing something. See the figures here. I read that being vegan, in and of itself, can offset 11 hours of flying. I don’t know if this is correct, but it sounds promising. You know how some countries banned plastic bags years ago, where others still haven’t? You know how Europe has resolved to ban certain ( not enough) single use plastics by 2021 ? I’m well used to not using plastic bags so in the countries where they still love to bag everything it’s easy to say no. Can we all maybe carry those best- case scenarios with us and act as if those bans were still in place, everywhere? Could we all complain like holy hell when supermarket companies like Australian Coles hands out free plastic toys in their own little plastic bags at checkout? 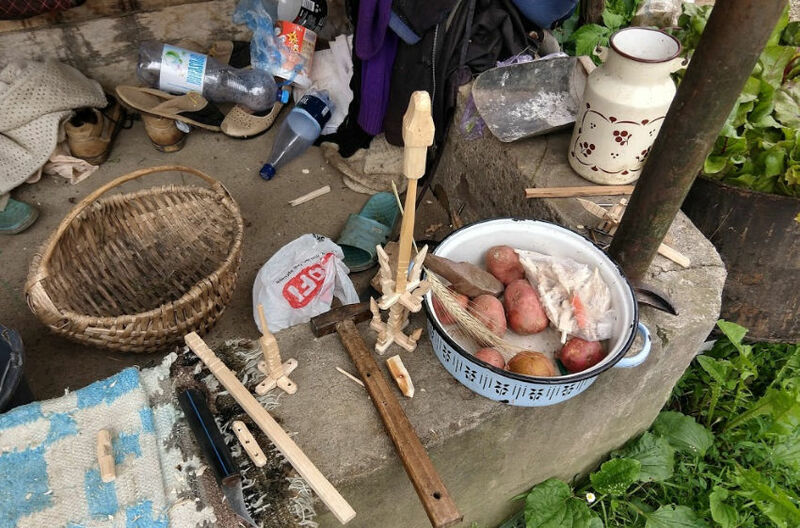 A snapshot of life in our village, where they saved everything, made everything, fixed everything. Never buy something new when you can make-do instead. We’ve all been inundated with ads for more eco-friendly products in the last few years. I’m even guilty of creating a sales page around this myself. But just because a product claims to be better for the planet doesn’t mean you need to buy it. Do you need those metal drinking straws? I do , yes, but you may not. Do you need to buy special kitchen scrubbers, cloths and towels ? Probably not, don’t you have any old bath towels you could cut up to scrub pots with? Use what you have. Nobody needs cling film to wrap food, let alone some product that claims to be a more eco friendly alternative. Don’t fall for the marketing, buy less, not more. These products are created to make money. If you look around your house I’m sure you’ll find something you could use for a job, or you could make something. I made shoe bags out of old T shirts. Stop buying stuff. If you’re going travelling you do not need special travel clothes, take what you have. Much as I like packing cubes and organisers, they are a want not a need. Cut it back and stop spending. Don’t be wasteful. I know most travellers want to save money, avoid excess and not create waste, that’s great. Maybe we could use the shop without the air con, not the one with. Maybe we could pick the electric vehicle over the one pumping out choking fumes, maybe we could put more effort into finding recycling bins. I’m sure we could all do more. I’ve just learned that some trains in the UK run off clean fuel. Maybe pick the journeys and countries doing the best job at reducing impact. I can’t be sure, it would be impossible to do the maths, but I think switching our old life for a travel lifestyle meant we affected the planet in a less damaging way. This is long-term travel, not holiday-making so it looks a bit different. For the last 6 years we have travelled full-time. We didn’t know when we took our 2 cruise ship crossings that these cruise ships were such massive offenders. I regret that and I apologise. But I do believe we’ve lived greener than we would have done had we stayed in our bricks and mortar home in Australia. Why ? 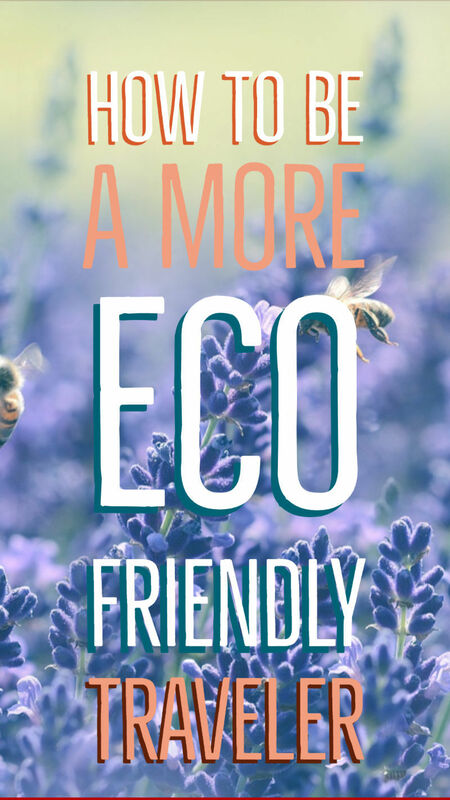 Here’s why I believe travel, long term, is more ecofriendly than staying home and there are so many lessons to be learned. The beds, rooms, linens, TVs, chairs, everything we used daily, were used by thousands of other people too in the guest houses of the world. Items were not bought just for us. We rarely stay just one or two nights and always refuse fresh linens and room cleans. The sort of accommodation we use generally doesn’t offer this anyway. Travellers don’t run air conditioners or heating all day because non A/C rooms are cheaper and we’re more often out exploring. We only have one room between 4 to heat or cool, not a whole house. We care about not buying water in plastic bottles and carry equipment and knowledge to avoid this. We eat out. We eat food at street stalls and in small local restaurants that has been prepared by one or two people for dozens. One huge pot of rice, cooked once and shared, one fridge holding everyone’s supplies, local fresh produce from the market going into a wok. There’s no heating a domestic oven just to cook a meal for 4. There’s less processed , packaged food. Less waste, less fuel. Of course, not every traveller ” eats out” in the same way. We, as backpackers and travellers, use public transport. Travellers don’t own or use cars. They do not take part in the daily commute to school, work or after school activities. We use solid packaging-free shampoo and are generally light on toiletries. If we settle for a while, it will generally be in places where there are local markets, not supermarkets. We walk to them. Full-time travellers do not often stay in luxury resort hotels where air-con runs constantly in open lobbies and towels and bedding are changed and washed unnecessarily. We do not pick-at excessive buffets where most food ends up wasted. We do not over-eat, we stay lean through not wanting to waste our treasured travel dollars. Long term travellers cross from country to country by land, they actually don’t fly very often because flying costs more and you miss out on the journey. We travellers eat less meat because we spend more time in countries with a stronger vegetarian and vegan food tradition. Meat is an expensive luxury in our favourite parts of the world and not the norm, as it is for many in the west. We eat local because we want to experience authentic local food. We give our tourist dollar to the local business, the little guy, not the huge corporations. Earth’s wanderers learn from the world. We see so much, we take those lessons forward with us and try to tread more lightly. We try to reach others to tell them why we need to do this and show them the damage that we have seen with our own eyes. We see the electric vehicles and those that pollute. We breath that air and know which is best. We see the plastic strewn roadsides and take note of them. We see the lack of fish in our oceans and vow not to hunt or eat marine wildlife. We see how the people of the mountains conserve fuel by storing their boiled water in huge insulated flasks – that’s one we took home with us, for sure. Just a few thoughts. I really believe our lack of consumerism over the last 6 years has been a huge factor in reducing our carbon footprint. We’re nothing special and far from perfect, but I have a hunch that it’s true. I know, without doubt, that since we came home just 4 months ago we have consumed and wasted so much more. An easy demonstration can be seen in my weight, I eat more at home. It’s not good. I’ve started buying things just because they are nice, not because I need them. I’m spending days in the house running air-con rather than being out walking and exploring. We don’t own a car through choice, but if we did I know we’d be making dozens of unnecessary car journeys. So as I said in the newsletter, our food producing, permaculture inspired garden is taking shape, our solar power ( controversial, you need to thoroughly research this) is coming and as always, we strive to consume as little as possible. Will we continue to travel ? I hope so, but right now we have no firm plans. I’m having a bit of an epiphany. So if you choose travel, as we did and do, it’s not necessarily as bad as the non-travellers want to make out. We can all do it with more eco-conscience, for now, maybe. How do you feel about this? Feel free to disagree, this is just another of my brain dumps and a way to get a conversation going. What a great read. It’s something that’s concerning us more and more. We are trying to be more sustainable while travelling…baby steps, but we’ll get better. Thanks for sharing on #fearlessfamtrav. I have honestly seen a lot of irresponsible travelers as I traveled across the globe. It saddens me that when we’re in foreign lands, we think that it’s alright to disrespect or pollute a place that isn’t our homeland. If we want to keep traveling to beautiful places for more years to come, let’s work hand in hand to be an eco-friendly traveler! We all need to look at the figures, there are charts above. Flying is hugely bad and offsetting it takes a lot, but vegan + no car + all the other things mentioned above is a start. My job is travel, it’s how I feed my kids, it’s also my passion, so I won’t be stopping flying entirely …particularly as we’re based in Australia! There should be special allowances for Australians, there’s no other way to get outta here. But in future, if we’re based in Asia or Europe, we can absolutely do all our travel by land, it’s super easy to do, if you have the luxury of time, which we have. Short term travel, with people running a home simultaneously is going to be an offender I guess , unless like the lady above, you’ve gone super sustainable. That would be like a dream come true, but a lot of work to set up. We can all just do our best I guess. Hmmm, I believe you have to compare like with like, and our eco-friendly overseas travel is nowhere near as eco-friendly as our stable life. When we’re settled we have massive organic food gardens, have established supplies of local and/or organic food, usually have a milking cow/goats and raise our own eggs and meat (we never buy meat). We have lived off-grid, so weren’t using mains power or water at all. When connected we pay for green options and our bills tell us our family of 7 uses less than the typical family of 2. We buy virtually everything second-hand and the rest as ethically as possible. We’re also big fans of dumpster diving (you’d be amazed at the clothes, bedding and kitchen ware we get, not to mention animal feed from human food) and creating from waste. When travelling we do our best, but we have to make many concessions. We can’t produce any of our own food, and use supermarkets much more. It’s harder to find organic. Buying ethical clothing is nearly impossible and I can’t sew and dye and make things from scratch like usual. We don’t have any control over how environmental our accommodation is. And flying is unavoidable as an Australian! We also find as a large family we can’t justify spending at least 4x more for trains or buses over flights. Apples for apples, I think travel is much more environmentally unfriendly for us. We’ll still do it because we’d go insane staying in the one place, but I don’t like the compromises we have to make. Once my husband gets his Greek citizenship we’ll be able to make a base here, get camping gear, and explore in a less wasteful way. Well done! Obviously for you, it’s different. Hopefully a lot more people will be hopping onboard with lifestyles similar to yours and living super sustainably soon. For us and most suburban dwellers in modern homes with jobs and school, it will be the reverse. It also depends where you go of course. We’re Asia nuts so mostly we’ll be found hanging out over there in the little guest house without the aircon. I’m actually thinking of starting another website on this topic, growing food, cooking, sustainable living etc. It’s something I love, but another website is a big fat headache. Haha YES to the headache! I thought of starting an eco-living website years ago (we definitely had the photographs for it) but found that the audience didn’t want to spend money (problems of marketing to people who are interested in frugal living). And I decided ads would be antithetical to a website talking about sustainability and buying less crap. It’s amazing what people do in suburban homes with suburban lives though, and it’s really the most sustainable option. There’s a belief in Australia that people need to go bush and buy 50 acres, but it’s far better not to. You’d have seen what can be done on tiny little plots with stacking. Yep, we have a whole heap of fruit trees out there and more going in. Just a regular sized plot. It amazes me that so many people hate gardening and just want grass. The old skills are gone. I remember my dad growing all our veg and my mum preserving. I bet most people have no memory of those days. Thanks for this! We’ve been on the road in SEA for the last 3 months and travelling for the last 9 months. eco travel is something that is definitely on my radar. With the flights, you can also buy carbon offsets in the event that you absolutely need to fly. I also came across this article lately which was really good too. We’re going to be in OZ on the east coast June 12 going from Cairns to Brisbane. Interested in getting together? If we’re still around, for sure. Hi Alyson, great post and tips. I’m also adjusting to travelling less since Andrew is working full-time again and while it’s tough because there’s still so much I want to see, at least we’re now taking less flights. I’m really happy to see the recent surge in Veganism as I don’t think we can solve environmental problems without tackling animal agriculture. I made the decision to become vegan mainly for animal rights issues, but the environment was a big driving force too. Most people (in the west, at least) eat three times a day, every day, so I think changing to plant-based food is the most effective thing we can do as individuals to reduce our carbon footprint. Like you guys, I’d love to have a space one day to grow my own produce, interested to hear more on this topic! It’s a work in progress…a LOT of work in progress! You should see the state of our garden right now! But the citrus, jackfruit and bananas are flourishing, I’ve got all my herbs. Next step will be loads of sweet potatoes and tomatoes, pidgeon peas, which are perennial shrubs, Nitrogen fixers…lentils! Also getting rid of as much lawn as we can in favour of food plants. But I do still need it to look pretty enough, I’m not going totally nuts. And yes, I read yesterda that being vegan offsets 11 hours of flying …I said above 5.5, I misread it first time. Even if the figures are wrong it’s a huge offset. Not buying food that’s been transported around the world is another huge offset, probably worse than the flying. Not running a car is awesome, I love it. I’ll still travel, for sure, but right now I’m too busy! Also because James and the kids still it meat outside the home and I feed them vegan at home, I reckon their footprint probably lies in the vegetarian zone, which is half of a meat eater’s. Might get some chickens though if the council will let us. Chicken poo is good for the garden and the eggs would be useful. Anyway, we all HAVE to change, it’s non negotiable. Very interesting turn in the conversation, Alyson! I believe the problem indeed is nit travel but transportation. I was told all my efforts in daily ecology were never going to compensate my air travel. Is this true? It doesn’t stop me from trying to live in an ecologically responsible way…. But I can’t stop flying…. This is a good read for my morning tea sipping. I just flew from the US to Delhi via London this week, arriving in the Himalayan town of Kullu in northern India just two days ago. The 2.3 T CO2 emission of the flight alone quadruples the estimated 0.6 T goal for the entire year as an individual human! Thanks for the links this was an interesting read. I am even more inspired to stay settled here (planning for a year or more with only local trips in India). Luckily in my unit I have no air-con nor need for heating until winter comes and in the community there are organic gardens and within walking distance markets, No cars except the occasional taxi. It is true that moving about in vehicles (cars or planes or otherwise) for “fun” is hard on the environment. You’ve inspired me to use my wanderlust energy to move my bum with my legs and to feel blessed that I can. Thank you, Namaste from India. I hope you have a simple AND fun day! It’s a tough one Heather and I’m pretty sure nobody has the answers just yet.